Have you seen the internet stories about a picture that appears differently from one individual to the next? Or heard the audio clips that sound like one word to some listeners and a completely different word to another? I offer this image to you? What do you see? Thousands of pounds of popcorn? 50+ volunteer hours to unload five (5) trucks? Your living room full of boxes? In short, I see stack upon stack of Scouting Adventures. The 2018 Popcorn Sale is about to begin. How will you support a Scout, a Pack, a Troop, a Post, a Ship, or a Crew? Will you purchase popcorn? 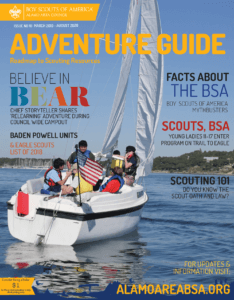 Will you volunteer your time to provide the opportunity for Scouts to learn how to communicate clearly and earn their way to their own adventures? Opportunities abound. What do you see?